Active Retention is a leading client retention and persistency expert in the Insurance, Financial and Technology industries - no one has more experience in working with these types of organizations in securing actionable customer feedback. We measure satisfaction, loyalty, referrals, new business opportunities and lost client win-backs on both a strategic and client by client tactical basis. We provide a unique Client Service Review Methodology and comprehensive technology solution to rapidly distribute our candid survey based responses. We leverage our highly secure web based dashboard for for both small companies and enterprise deployments. And our unique methodology ensures rapid results and no on site implementations for a compelling Return on Investment. In fact, we guarantee a 300% hard dollar ROI, in writing, for our Client Service Review projects. Our easy to use executive dashboard, instant alerts and automated internet reminder system ensure users have rapid and simple access to critical client responses. And every client solution includes a tailored Opportunity and Issue Workbench, allowing our clients to track and follow up on every opportunity and issue we identify. We can help you rapidly achieve a comprehensive client feedback management system. Join organizations like The Hylant Group, Dendrite International, The Horton Group, Barney & Barney, RTI International and Crawford Advisors to mention just a few of our clients who have successfully deployed a comprehensive Client Feedback Management solution. 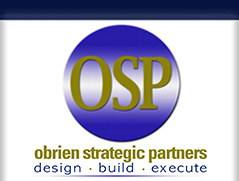 Copyright (c) O'Brien Strategic Partners, LLC. All rights reserved. Website created by StartUpSelling, Inc.